The neutron experiments carried out at Intense Pulse Neutron Source (IPNS), Argonne National Laboratory and Los Alamos Neutron Science Center (LANSCE), Los Alamos National Laboratory, reveal surprising new findings in Fe1-xO. Variable pressure-temperature neutron diffraction techniques were applied to investigate the magnetism of the rhombohedral phase of Fe1-xO (wüstite) above 15.0 GPa, a long standing controversy and fundamental problem for this material. Magnetic peaks similar to those at 180 K at ambient pressure were expected to be observed in the high-pressure rhombohedral phase; however, they are not evident in our high-pressure diffraction patterns (to 20.3 GPa at 300 K). The absence of magnetic peaks indicates the absence of long-range magnetic order in Fe1-xO under these conditions. This result indicates the need to reconsider the interpretation of high-pressure Mössbauer studies and the mechanism of the high-pressure phase transitions in Fe1-xO [Ding, et al. Appl. Phys. Lett., 86, 052505 (2005)](pdf). 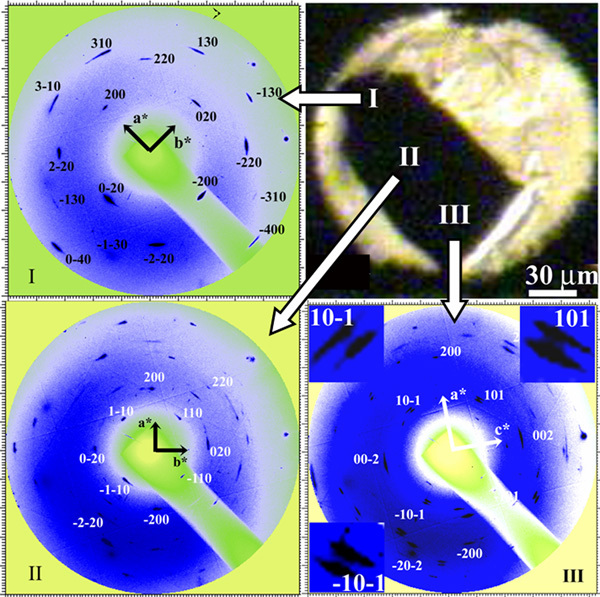 Moreover, our recent zone-axis synchrotron x-ray diffraction experiments on single crystals reveal that Fe1-xO has a long-range defect-cluster order-disorder transition around 14.0 GPa [Ding, et al. in preparation], and existence of pressure-induced multiple phase transformations occurs above 35.0 GPa [Ding, et al., in preparation]. These results indicate that Fe1-xO has very complex behaviors under compression, requiring a combination of many techniques to investigate the interactions of charge, spin, lattice, orbital moment, and defects in this system. This research was conducted in partnership with the Carnegie Institution of Washington, University of Arizona, Argonne National Laboratory, and Los Alamos National Laboratory.